(By Matthew Williams) The war for the Middle East is a multi-generational conflict. From the outside, public understanding is largely influenced by narratives of sectarian violence, religious extremism, historical instability, the “Global War on Terror” – including occupation and state-building – oilfields, and the threat of ISIS and Al-Qa’ida. These are staples in explaining the Middle Eastern wars and the collapse of the Arab World. The Economist stated the question in 2014: ‘Today the Arabs are in a wretched state…Why Arab countries have so miserably failed to create democracy, happiness or wealth for their 350 million people is one of the great questions of our time? The preconception that the Arab world is in ‘civilisational decline’ is misleading. The Greater Middle East is revolutionising warfare, and in-turn society across the region and the Western state. The 2003 invasion of Iraq, according to Edward Luttwak, marked “the accomplishment of a revolution” in military affairs as a conventional army which rolled into Baghdad to uproot Saddam Hussein, ill-equipped for post-modern guerilla warfare transformed itself into an asymmetrical tech-savvy fighting force. Caught between warring militias, jihādists and tribal factions, thousands of American and British soldiers were killed and wounded in urban combat during this baptism of fire. In response to these casualties, the use of robotic systems and drones to counter the technological innovations of Iraqi insurgents, including the improvised explosive device (IEDs), surged from zero to twelve thousand between 2003 and 2008. Iraq and the Second Lebanon War (where Hizbullah used drones for the first time) proved that the technologies developed by the Western militaries (including Israel) could not be monopolised by their states. Insurgent groups were already utilising robotic and technological developments for tactical and strategic purposes as the robotics industry seeps into everyday life across the globe. The supposedly “barbaric” and “medieval” jihādists and insurgents rejecting Western democracy were converting counter-IED robots into IEDs and continuously innovating to counter coalition jamming equipment and using mobile phones to detonate car bombs from afar while releasing DVDs and videos instructing aspiring foreign fighters how to build bombs and cut off heads. The results of technology wedded to ideological conviction and a spoonful of Iraqi nationalism ravaged the Bush administration’s state-building project. Fast-forward to 2016 and insurgents and militias in Syria, Yemen and Iraq use E-books, new media, computer games and apps to spread propaganda and disinformation, train foreign employees, and inform clients and supporters of their breakthroughs and deploy remotely controlled Stg-44s using iPads, iPhones and computers. Regarding the Arab Middle East and its current chaos as backward or a failure of imagination would be a disservice. The Middle Eastern conflicts are setting the benchmark for future upheaval that will come with the integration of robotic systems with human warfare and are asking critical questions concerning how technology is swiftly beginning to challenge and undermine conventional international laws and institutions. Uniforms and conventional armies are history and the world has become a battlefield, spurred on by globalisation, digitalisation, algorithms and robotics. The Middle Eastern conflicts are the testing ground for future trends in warfare. Hizbullah have been deploying commercial drones to conduct strikes on Syrian rebels opposed to the Assad regime in Aleppo while the Israelis, according to Israel Aerospace Industry, are set to purchase a fleet of cheap suicide drones which can deliver a deadly package via a tablet app. The drone swarms and fleets on display in games such as Call of Duty: Advanced Warfare and Black Ops do not dwell in the realm of fantasy. They are trends just around the corner in Middle Eastern combat. LOCUST programs (Low-Cost UAV Swarming Technology) will challenge conventional missile defences and air forces and the Israeli LOCUST suicide bomber fleet will be cheap when measured against the cost of other robotic systems. Each LOCUST quadcopter cost tens of thousands of dollars, millions cheaper than traditional Hawks, Predators, and Wasps. According to P.W Singer, for the price of one F-22 military jet manned by a traditional pilot, ‘you can buy eighty-five Predators ($4.5 million each)’. 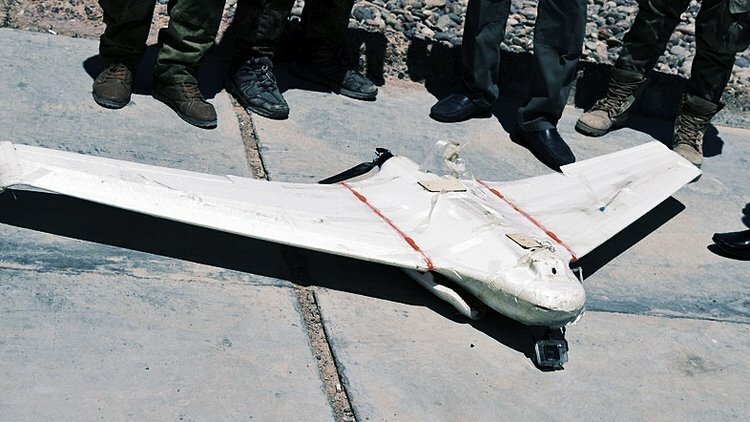 In the United States, the drone has become the core pillar of its military doctrine striking targets in Syria, Iraq, Yemen, Somalia, and the Pakistani-Afghan theatre. The Drone Papers released by The Intercept emphasise the breadth and depth of the Pentagon’s drone programs and highlight the significant human costs which have accompanied innovations in UAV (unmanned aerial vehicle) and UAS (unmanned aerial systems) conflict. Royal Air Force reaper drones were involved in a pivotal raid which ‘accidentally’ killed 62 Syrian soldiers and target British foreign fighters across Syria and Iraq. To understand advanced warfare, the latest round of violence in Gaza, the Third Lebanon War and the continued evolution of the violence in the Arab Middle East will be the conflicts to analyse while the region’s history will serve as warnings that military and technological innovations will not be a substitute for political solutions and authentic, old-fashioned diplomacy. Traditional attacks launched by Al-Qa’ida and Islamic State across Europe, the United States, and the Russian Federation in the form of suicide bombings, mass-shootings and individual rampages using trucks and knives will evolve into a commercial drone being used to conduct an attack on civilians in Western cities. With the drone industry estimated to be worth $125 billion by 2020 and record arms sales being done in the Middle East between the United States, Europe and its clients (state and non-state), the likelihood of such weapons being utilised in an attack are an inevitability, one which governments are ill-equipped for despite innovations in homeland security since September 11. Even these innovations in their current formats were unable to prevent devastating conventional terrorist attacks in Belgium and France in 2015 and 2016. The security threats are multi-dimensional to both policymaker and business amidst a surge in robotic and technological development. What measures should be put in place to prevent future attacks with drones against assets and interests? How are civilians, clients and assets to be protected from insurgents and state actors utilising robotic and cybernetic warfare against them in terrorist attacks? How do you attribute such an attack to a specific state, non-state actor or individual? How does cyberspace and technology impact conventional ethics and rules of war? How do governments and business bureaucracies cope with technology’s rapid advancement and dynamism? What are the reputational risks which robotic industries will face when it comes to distributing robotic equipment which can be converted into killer hardware by governments with appalling human rights records? Security and commercial incentives are entwined while technological momentum is irreversible. Militaries are operating with smaller footprints, faceless, and using electro-optical, infrared and synthetic-aperture radar sensors to maximise asymmetrical warfare. However, the belief that the Pentagon can maintain complete hegemony on the military robotics industry is a weakness particularly in a multilateral world where hierarchies are flattening out rapidly. If particular commercial and security interests are fused, the threat to conventional political institutions and thought becomes clearer when states are locked in permanent states of war against real and imagined non-state forces. In the midst of the Robotics Rush, how do free markets, regimes, liberal institutions, and democracy adapt to and survive such swift and radical change? These are urgent debates which must begin now. (By Matthew Williams)The war for the Middle East is a multi-generational conflict. From the outside, public understanding is largely influenced by narratives of sectarian violence, religious extremism, historical instability, the “Global War on Terror” – including occupation and state-building – oilfields, and the threat of ISIS and Al-Qa’ida. These are staples in explaining the Middle Eastern wars and the collapse of the Arab World.